Sony PVM-741 is another leap in Sony imaging technology. Using the new OLED (Organic Light Emitting Diode) technology, blacks are black. Contrast is mesmerizing and your picture never looked so good. Incorporating Sony’s “STE” (Super Top Emission) structure, the PVM 741 can display extremely wide gamut colors and repel panel glare so that "on set" or "in the field" viewing is simple and accurate. Sony PVM-741 also includes other features that make it the favorite for view and framing camera images. The new “Flip” feature can swap the image horizontally, vertically, or combined so that over and under 3D rig viewing is a simple push of a button. The SD/HD/3G input is not an option so even display of HD 60P images is a snap. The chassis is made of cast aluminum for durable in field use and includes a protection panel for the OLED so that rough handling has no effect on performance. The small size of Sony PVM 741 allows usage in various applications including ENG/EFP, OB Van, Editing Systems, and Monitor Walls. By employing a 960 x 540 16:9 OLED panel, contrast is as never seen before and image lag is a thing of the past. Picture quality is excellent both indoors and outdoors. Additionally Sony PVM-741 incorporates Sony’s ChromaTru color processing which allows Sony PVM741 to accurately display images as SMPTE, EBU or ITU-R BT709 color standards. 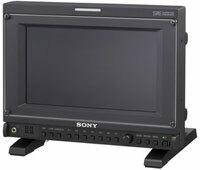 Sony PVM 741 comes standard with one composite, one auto detecting SDI/HDSDI/3G input. One HDMI input, internal waveform monitor, AC power adapter, and ¼ and 3/8 holes for camera mounting. Featuring Sony’s new STE OLED panel Blacks are blacker, gradients are smoother, motion is fluid, and picture performance greatly improved. Super Top Emission (STE) Technology Sony’s exclusive Super Top Emission Technology provides a brighter panel with longer life, lower power consumption, and combined with special color filters which increases color saturation while rejecting outside reflections that would interfere with the picture when used in outdoors applications. New Flip Feature 3D is now the focus on many productions, so tools that fit this requirement are always welcome. New to the Sony monitor list of features is an image flip function. This is required when 3D camera rigs are using half mirrors to help simplify acquisition. The image can be flipped horizontally, vertically or both. Superb picture quality and stable color reproduction *Precision imaging achieved with 960 x 540 pixel , 7.4 inch OLED panel using 10 bit drivers. *Black levels lower and more defined than CRT (when compared to Sony BVM-D9H5U 9" CRT monitor). *Multiple color gamut display (SMPTE C, EBU, ITU-R BT709). *10 bit professional display engine.